The sense of unity among Europeans has hit a new low. However, economic inequality, institutional deadlock, and the migration from former colonies are linked. They won’t be solved without cooperation and common solutions in and around Europe. While European democrats miss the common sense of direction needed, violent nationalists are gaining momentum. We need a new ‘can-do’ attitude to find value based and sustainable solutions for the future. We need a stronger cohesion within Europe and a further understanding for European responsibility in the world. By helping to overcome the many borders existing between people and societies we can contribute to this vision. We see our efforts in the tradition of civil rights movements like Ghandi’s in India, King’s in the US and Mandela’s in South Africa. Our work is inspired by the anti fascist Manifesto of Ventotene from 1943 and Ulrike Guerot‘s vision of a federal European Republic. 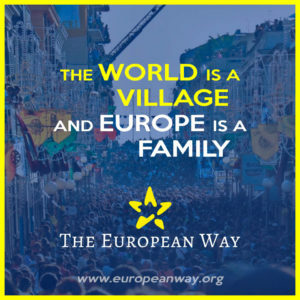 Being ‘European’ means to oppose a supernation, since it is nationalism itself that stands in the way of sustainable relations, peaceful solutions and further European integration. Nationalism is putting the future of the European Union at stake. It evokes a community based on arbitrary criteria such as language and origins. We oppose the ideology of nationalism and its inconsistency with a nonviolent society. We pursue a single European public not divided by national and linguistic borders any longer. Our focus is to engage with interested people, groups and institutions in order to gain attention for our cause. Since we uphold the teachings history gave us and will give again eventually, we target everybody who fights for democracy, solidarity and the universality of human rights.